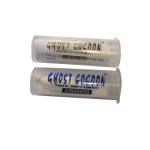 Ghost Cocoon is the leading bait thread used by UK anglers. It is ideal for securing soft baits such as peeler crab, black lugworm or mussel to hooks to ensure that the bait with withstand casting, impact with the water and strong tides and can also be used to secure cocktail baits together, or attach large baits to pennell rigs. It is much thinner than other bait threads which means it is virtually invisible once under water. Each unit contains 220 metres (over 700 feet) of thread and will therefore last for a very long time, even with heavy usage (many inferior brands contain less than half of this amount). 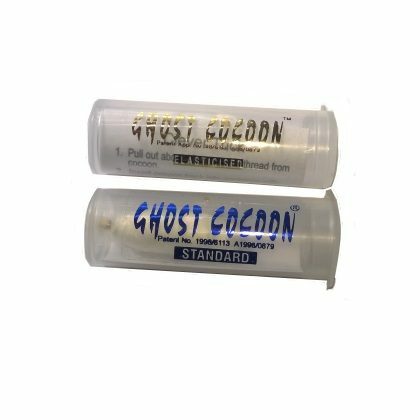 Ghost Cocoon has been used by sea anglers for many years and remains as popular as ever. Available in two types: standard which is non-stretchy and elasticated, both priced at £1.99 each.